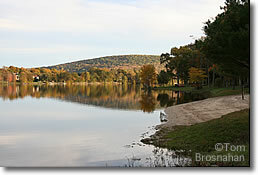 Connecticut's largest nature center has over 35 miles (56 km) of walking trails, campsites, and several prime perches for birdwatching, just outside Litchfield. Trails at the White Memorial Conservation Center, on US Route 202 just outside of Litchfield towards Bantam, are open for free to hikers, mountain/trail bikers, horseback riders, and corss-country skiers, all year round. The Center also has a museum with dioramas, mounted specimens, live animals, a touch center, and a 4000-volume nature library which includes a children's room. There's a small admission fee for the museum. Windmill Hill Family Campground has 18 campsites, and Point Folly Family Campground, on a peninsula in Bantam Lake, has 47 campsites. Sites in both campgrounds must be reserved in advance, and a fee paid.